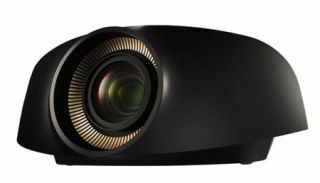 CEDIA EXPO 2011: Sony debuts first 4K home projector | What Hi-Fi? Sony has confirmed the VPL-VW1000ES will now be available in January 2012, with an estimated price of $25,000. Sony has launched the world's first 4K consumer projector, the VPL-VW1000ES - a 3D-capable design able to support resolutions more than four times that of Full HD. The new flagship Sony VPL-VW1000ES brings 4K digital projection - already available in cinemas - into the home, though as yet consumers don't have access to the 60+ new and classic movies mastered/remastered in 4K format. Until native 4K content is more widely available - and some video does already exist online - users of the VPL-VW1000ES will be dependent on its 4K upscaling engine, which can upscale both 2D and 3D Blu-rays and HD TV. The VPL-VW1000ES is based on a new SXRD 4K panel, which Sony claims delivers outstanding black levels. The company claims the projector will offer 1,000,000:1 dynamic contrast ratio. The new model is also capable of 2000 ANSI Lumens brightness - twice the brightness of any existing Sony consumer projector, and a crucial factor in its 3D performance. The projector will support a picture of up to 200in (diagonal), and offers variable throw distances and format options, alongside advanced install features and "near-silent" operation. It weighs 44lb. Judging by the impressive demo here at CEDIA Expo - running a 4K trailer of next year's The Amazing Spiderman - we can't wait for a longer play in the What Hi-Fi? Sound and Vision test rooms for our Temptations section. The Sony VPL-VW1000ES will be available in December. We'll bring you more details, including estimated pricing as soon as possible.